Cartoon Bank: An impressive searchable database of 85,000 single pane cartoons pulled from New Yorker Magazine archives, including including all the cartoons ever published in The New Yorker. 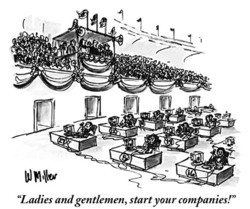 Entrepreneurs seeking, for instance, to emotionally connect with an audience in a presentation--through humor, can use the site to search among tens of thousands of New Yorker cartoons, download one for $20, and immediately insert it into a powerpoint presentation. Companies seeking to do better than a desk set as an executive gift can have an entire cartoon book created just for them. Every page, every cartoon, is selected individually to correspond to the client's business. Entrepreneurs can also commission New Yorker artists to create original cartoons for them--cartoons that can be used in all media: web sites, emails, brochures, etc. It really is a massive collection, and nearly every search I've performed comes up with something. Varies: a cartoon for a presentation is $20, license for 500 printed is $50, several hundred dollars if you want to put one in your next book. Good stuff. Thanks Carson. Funny thing about AdSense: you have an ad for the cartoon right below your article. Hah! Interesting. That's what I call contextually appropriate ads.